I have been so creatively inspired since I got home from Massachusetts. I had totally been feeling it while I was there, but I lacked the resources to let it flow. Now that I’m back in the ‘Burgh and have access to all my crafting supplies, I can’t seem to stop. 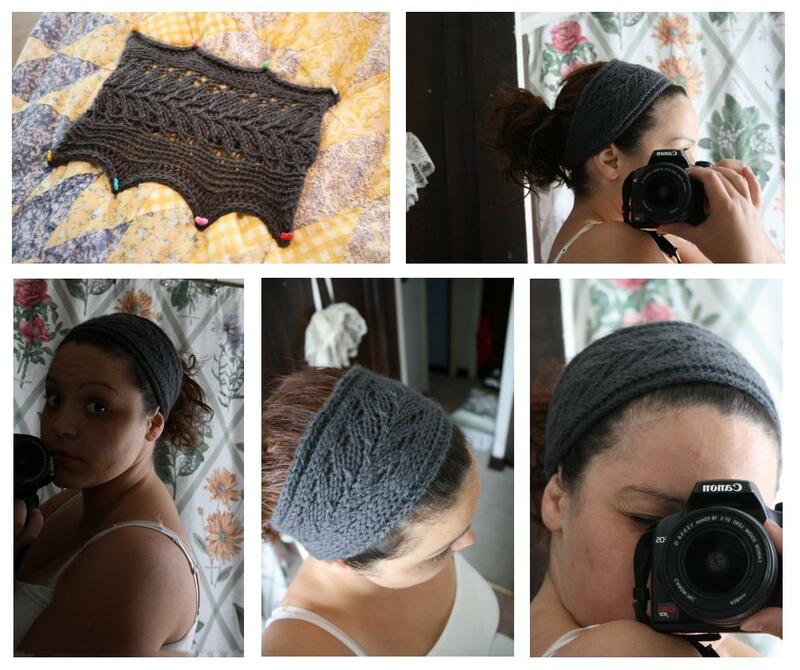 I knit myself this headband after I saw the one Evan made. Hers is way more colorful than mine and her lace work looks nicer. Even so, I like it. Although, I think the next time I make this, I’ll use thinner yarn and bigger needles. Work until piece measures 5 in from CO row. BO all. On each side, fold end toward center about 2 in and seam the edges together, creating a pocket to slide the Swiffer head into. The whole thing took me about an hour. It’s a nice and easy, instant gratification project. And very green, if I do say so myself. I also made this headband out of an old t-shirt Johanna gave me that didn’t quite fit me right, even though I really liked the color. 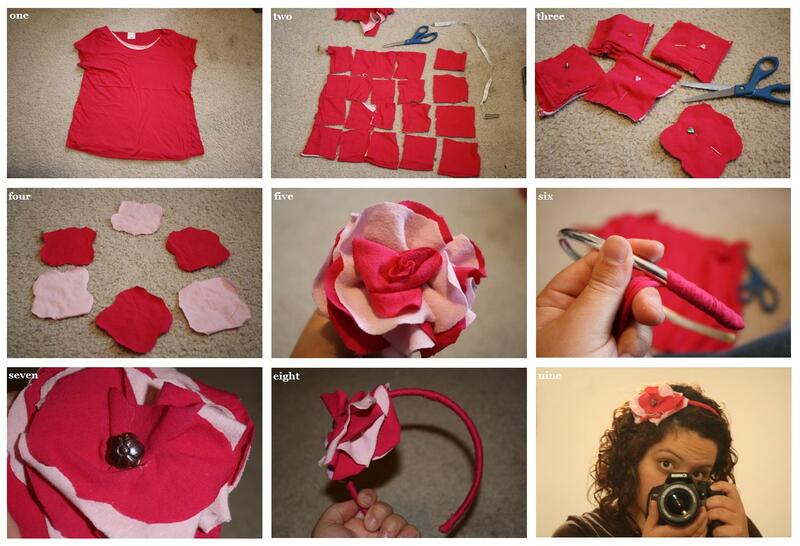 I’m really into upcycling now, thanks to spending a year learning to be thrifty from Johanna and from reading Erin Archer’s blog. Not bad for only using items I found around the house. I’ve been pricing these things when I see them in the store for the last several months and I haven’t found one selling for less than $10. I think I spent $2 buying that silver headband in a three-pack over a year ago– I don’t think I ever wore it. I have enough fabric left to make four more. And then there’s my big project. 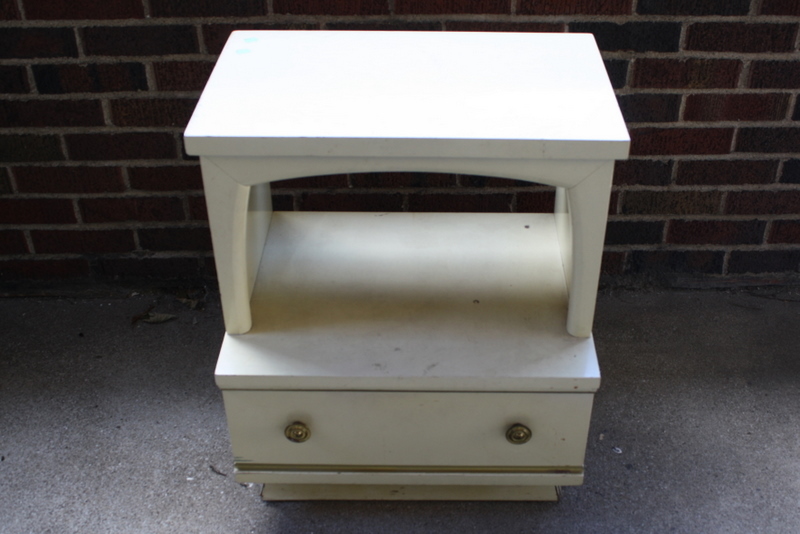 This very 1950’s nightstand was a thrift shop find for $5. As soon as I saw it, I knew I wanted to paint a peacock on it, which could mean that I’m crazy and a little too ambitious or that my window-shopping trip with Evan to Anthropologie for creative inspiration really paid off. Either way, I’m excited. I loved the cracked paint and yellowed antique color, and even the tarnished brass knobs. However, I was sorely disappointed when I realized it had also acquired more coffee stains and crayon marks from careless children than I was comfortable with. So I gave it a fresh coat of interior semi-gloss paint, courtesy of my mother’s basement, and now it waits for me to come and make it into something entirely different than a boring whitewashed nightstand. I’m unspeakably thankful for creative outlets right now. It’s like therapy… only prettier and more productive. You are inspiring me! I wish you were still in MN. I’m coming home for a visit soon. In fact, if you want to get my newsletter at your new location, email me your mailing address. Miss you! Wish we could do some projects together. I LOVE the headband! so cute! !